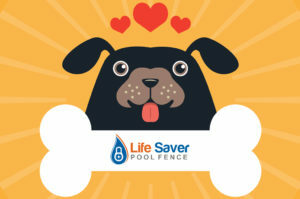 Life Saver’s pool fence is a removable mesh pool fence designed specifically to provide a barrier around residential swimming pools for toddlers and young children. The fence is installed in sections to provide convenience for easy removal and re-installation by you, the homeowner. It is available in 42, 48, or 60 inch heights. Our most popular colors are black, brown, green, tan, and white, with custom color combinations available. Our tension based system utilizes a series of 15 foot sections of the highest grade Textilene ® mesh fence. One inch holes are drilled 4 inches deep into the deck, non-conducting polypropylene sleeves are inserted into those holes, and the fence poles are inserted into the sleeves. Each section of fence is connected to the other at the top with 2 1/2 inch safety latches. What does this mean to you? The fence remains sturdy by tension supplied from solid core reinforced aluminum poles. Our aluminum poles uses a solid reinforced center and boasts high performance pole wall found in the industry today. No other pole compares. The border of the pool fence can be considered the most crucial element. 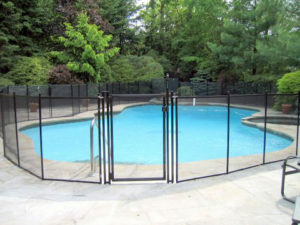 Your Lifesaver pool fence will come with a QuadStitch reinforced border providing superior strength to the pool fence. Life Saver pool fence can be installed in any type of deck i.e, pavers, wood, concrete, stone, and soil. Life Saver pool fence is constructed with Textilene® polyester mesh fabric utilizing a mildew resistant polyvinyl coating that provides years of use in the harshest sunlight and extreme winter conditions. It’s woven with a continuous basket weave that boasts an incredible tensile strength rating of 270 lbs. per inch making it impossible to rip under normal use. The mesh comes in black, brown, white, beige, or green and is bordered on all four sides by a reinforced vinyl material with a strength rating of 387 lbs. The border is QuadStitched with the strongest marine thread to allow for years of abuse from direct sunlight and the elements. Be sure your pool fence has four stitches on the border. The finished mesh is securely mounted on solid core reinforced aluminum poles and reinforced with aluminum cove molding strips attached to the length of each pole. Life Saver’s self-closing, self-latching gate utilizes a square frame that can support itself with or without the pool fence. It is completely removable or it can be pemanently anchored. The gate is constructed of 1 1/4″ boxed frame aluminum with a 1/8″ thick wall with a mesh color to match your fence. The welded finished product is powder coated and available in many color to suit your needs. The Snap Latch is used to connect the sections of fence to each other. It is nickel-plated with a stainless steel spring guaranteeing that it will never rust, corrode, tarnish, or deteriorate in any fashion and is covered by our Lifetime Warranty. Have Any Questions? Need Help? Get a FREE, no obligation estimate! Do You Have Pets At Home? Click The Image Below To Learn More On How You Can Protect Your Pets From The Dangers Of Your Swimming Pool.